It was my second year of engineering - 2006 - started watching 'Friends' - the rite of passage for all binge watchers. It was only regional movies and series for me. It began to become a hobby then - arrange things and binge watch. Start a new series on the laptop and while watching dump all things you own on your bed, clean shelves, and categorize them as to keep and to throw/donate, and gulp down shows after shows. It is still my favorite hobby but not something you can frequently do when you have a permanent roommate grunting that I eat up all the space on the bed. Recently, while I spend the weekend trying to find a new show to watch, I asked on Instagram which shows to watch, and Sanjana suggested that I do a post about what I like to watch. 96% people voted yes so, here is my list of favorite shows that I think one must watch. I have divided the post into two. This is comedy and drama. There will be another post with Thrillers and Crime shows. Comedy with sharp puns on patriarchy with strong oriented women surviving the male-oriented office space - Parks and Recreation and 30 Rock - I loved both the shows. I liked how every character was thought of and portrayed on screen. I do not think anything would be able to play the characters better than the ones in the show. Each one them is etched in my mind. I wish I had characters like those in my life - there won't be a single dull moment in my life. Even now and then when I am feeling down/unenergetic - I see quotes from these shows. Courtroom drama with strong women with flawed character: The Good Wife: A woman has to leave her practice to support her husband and years later, her husband goes to jail leaving her with teenagers to care about. She joins back as a lawyer where people with who she studied are already partners in the firm, and now she has to fight with fresh blood to survive - all thing while the shadow of her husband's scandals hangs on her. I am not a drama person but this one was an exception, and I enjoyed this thoroughly. People in their 20s trying to figure out Love and Friendship: How I met your Mother: I know I am going to get some backlash on this but here are my two cents on this show - do not compare it with friends and do not watch it as a quest to find the mother. It has nothing to do about the mother because….well, no spoilers here. I loved the show because of Lily and Marshal. They gave me a lot of practical lesson of love, which kept me going in my ten years of long distance relationship. Give this show a change when you are in love. Medical Students trying to survive life and residency: Scrubs: I think medical students will relate more to this, but I liked the show. It is a lovely show - not much of medical jargons (If you want medical jargons then watch House or Grey's Anatomy). It is also about friendship and love in a demanding and competitive work environment. It is a silly show about life lessons. Go figure! 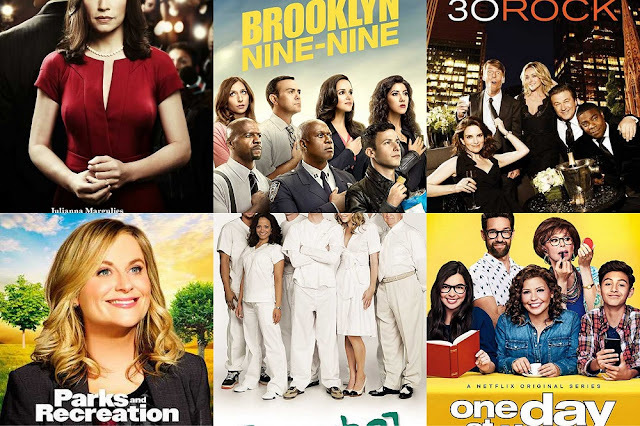 Comedy with drama show full of diversity: Brooklyn Nine-Nine: In case you watch carefully if you must have found that how most shows have a token person to add 'ethnicity' and not make the show non-white? Well, this show has an openly gay black police captain portrayed in a non-stereotypical way, career-oriented Latino woman and Gina! Gina is a person of her own and how would I love to have someone like her in my life. Just go watch the show, please! Sitcom about adapting to a different world while in touch with one's roots: One day at a time: Just because you have to leave your home ground to settle somewhere else does not mean that you have to forget your roots. You adapt but do not change. This happy warm show has a woman who had to leave Cuba and start a life in America. She will win your heart for sure. There is a war veteran single mother who is raising two teenagers. Some episodes drag a bit but you will like it overall. This is not all. This is all I that could think of at the moment. I will add more in this. So, do check back in some time. Let me know your favorites. I am all ears.